1992-1996 , Faculty of foreign languages, Karaganda State University named after E. A. Buketov, specialty “English” . 2011-2013.Faculty of Economics and Management , Karaganda Economic University of Kazpotrebsoyuz, specialty “Management”. 1996-2006, English head teacher, Karaganda State Technical University. 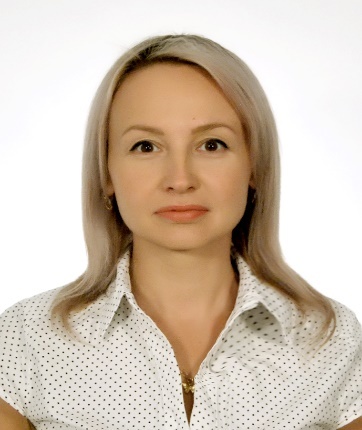 2006-2018, English head teacher, Karaganda Economic University of Kazpotrebsoyuz. Present, English head teacher, Karaganda State Technical University. 1. Problems of national environmental audit improvement . International scientific-theoretical conference “Socio-Cultural and economic-legal problems of modern society modernization “Student spring-2013″. ; KEUK 2013, – P. 42-47. 2. ISO 14000 and EMAS standards implementation as a stage of environmental management. International scientific-theoretical conference “Socio-Cultural and economic-legal problems of modern society modernization “Student spring-2013″. ; KEUK 2013, – P. 197-202. 3. English as one of the most significant languages for Kazakhstan. G-Global. ; 2015. 4.The main directions of “Kazmunai Gas” environmental management Bulletin of Modern Science. Scientific and theoretical journal.- Volgograd: Рublishing “Sphere”, 2015.- №7, Part 1.- 2015. – №7. – P. 101-104. 5. Multilinguism in the United Nations. International scientific and practical conference of undergraduate and graduate students “United Nations: Global diplomacy in a changing world”. ;KEUK 2015,-P. 246-247. 6. Interaction of language and culture in modern multicultural society. International scientific and practical conference of undergraduate and graduate students “United Nations: global diplomacy in a changing world”. ;KEUK 2015,-P. 246-247. 7.Interaction of language and culture in modern multicultural society. International scientific-practical conference of foreign students of preparatory and basic faculties, students of foreign citizens training Centers of higher educational institutions.Kharkiv national University of Radioelectronics. ; 2015, – P. 43-44. Тechnology of mobile learning in the educational process. International scientific-methodical conference “Open distance education as a form of globalization manifestation: Experience, problems and prospects of development”. ; KEUK 2016.- P. 32-34. 9.The method of projects in English classes (using Internet technologies). International scientific-methodical conference “Open distance education as a form of globalization manifestation: Experience, problems and prospects of development”. ; KEUK 2016.- P. 101-103. 10.Multilingual education-an important development strategy of modern society formation. International scientific and practical conference of students and undergraduates “the Future of modern society through the eyes of youth. Legal, financial, economic, cultural and moral aspects”. ;- KEUK 2016, – P. 302-303. 11.The Development of Human Resources by Means of Polylingual Specialists Training. G-Global. ; 2017,- С .410. 12.The method of projects in English classes using Internet technologies. G-Global. ; 2017, – P. 447. Technology of mobile learning in the educational process. G-Global. ;-P 436. 14.XIII International scientific and practical conference “Actual problems of modern science in the 21st century” Makhachkala 2017 SIC “APPROBATION”– 2017. – P. 93-96.